Based on the true story of a 1960s interracial couple who enters a dramatically dark world of crime where they are challenged by law enforcement, the Ku Klux Klan, gangsters, and rival street hustlers. Richard and Mildred Loving were an interracial couple, but neither one of them were criminals. During the same period of the Lovings relationship, a rare brand of interracial couple would emerge. Enter Alla Mae Briggs. She is four foot eleven and one-hundred twenty pounds of pure street hustle. Alla Mae has engaged herself in crimes such as prostitution, petty larceny, theft, and forgery. It is the early 1960s and vice is at an all-time high on the dangerous streets of Kansas City, Missouri. Alla Mae has never worked a legitimate job in her young life and probably never will. She meets her match when a career criminal named Gordon Reynolds witnesses her skills as a masterful street hustler. Her ability to con and rob men of substantial amounts of money is the perfect recruit for his criminal stable. There might be a twenty-six year difference between their ages, but they won’t allow the wide gap to stop them from making money together. Alla Mae and Gordon realize that they’ll be facing incredible odds against a predominantly white racist society. They’re very well aware that interracial unions are outlawed in seventeen states across America. Missouri is definitely one of the frontrunners in stopping blacks and whites from marrying or living together. Despite the ongoing threats of the anti-miscegenation laws, they move forward with their plans to make money together in vice. Gordon uses money obtained from his criminal activities to purchase two houses at the far north end of Kansas City. These houses will be used solely for the purpose of prostitution, drugs, liquor, cigarettes and a little gambling. Gordon gives Alla Mae exclusive control over prostitution inside both bawdy houses. She utilizes her skills of recruiting experienced prostitutes to come and work for Gordon. Customers visit the houses and are given a choice between their selection of luscious prostitutes. While Alla Mae handles the prostitution end of their vice activities, Gordon and one of his closest friends set up rooms in the bawdy houses to stash the liquor, dope, cigarettes, and illicit cash. What will Gordon do when his supplies get low? He’ll do what any other smart street hustler will do. Hijacking, stealing, robbing, and bribing are his methods of obtaining more goods that his customers so desperately need and want. In the end, Gordon Reynolds and Alla Mae Briggs learn that they have a lot more in common than just a life of crime. It was their love for one another which bridged the gap between their big age difference and the color of their skin. 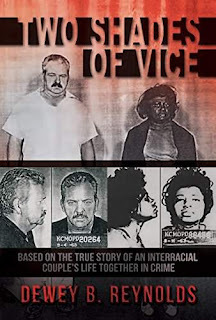 Based on Dewey Reynolds’ nonfiction, true crime book about his real life parents, who were a white man and a black woman, and who were two people who started out together in a life of crime, but ended up expressing their undying love for one another.